One month minimum rental period. Charming, vintage lakefront cottage with modern upgrades. 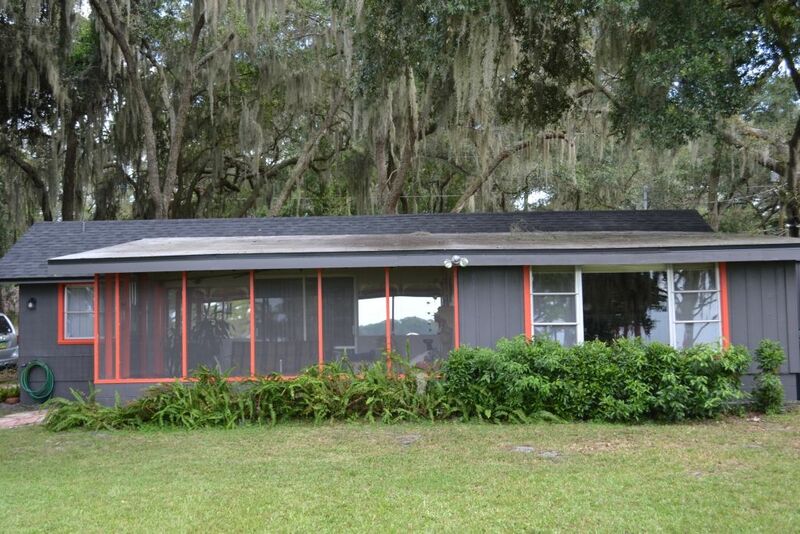 Enjoy this private setting in a quiet neighborhood minutes from the historic downtowns of Mount Dora and Eustis, both famous for antique shopping, numerous arts and crafts festivals, car and boat shows, and fantastic restaurants. The location is within one hour of Disney World and other Orlando area theme parks/attractions, as well as one hour from Daytona Beach and other Florida beaches. Our cottage was one of the first three “fish camps” built on Lake Joanna in 1940. The property is set on the east shore of the lake providing spectacular sunset views! Lake Joanna is private to the surrounding home owners and consists of a 300-acre, clear, spring-fed, freshwater lake providing a great setting for endless water sports and fantastic fishing. Our new dock has an electric boat lift, built in seating, lighting and potable water. Bring your boat and/or fish from the dock for Largemouth Bass, Speckled Perch (a/k/a Specks, Crappie), Bream, Shell Crackers, and more. Our location is also minutes from the expansive Mount Dora chain of lakes, comprised of several huge, river-connected freshwater lakes. Many of these lakes cover thousands of acres each, providing for days and days of boating and fishing possibilities. Screen porch. Dock with power, water, boat lift, lighting, built-in seats. Private airport within one mile. Ultralights often flying around/over the lake and seaplanes often take off and land from our lake. A great place to stay. We were there for two months and a great time. I stayed there from Jan. 1st, 2012- April 29th, 2012.. Very clean , safe area, friendly neighbors. Enjoyed downtown Mount Dora and near by activities. Was out on the dock all the time. Water was great. I am hoping to return soon. The owners were very accommadating with information on things to do and see. I have stayed at this property on two different occasions. Loved it both times! Once was with family, friends, and fun on the lake. Water sports, bar-b-que, horseshoes, and all around family activities to keep both kids and adults entertained. Easy access to grocery and sporting gear stores. Second time was a romantice weekend with just me and my husband and no phones, TVs, or computers. Beautiful Sunsets and great early morning canoeing on the glassy lake waters. We even caught some pretty big bass! Friendly and helpful owners. We will definately return for more R and R!. we stayed at this lake house and it was VERY clean and neat. Great view and Beautiful new dock. had a great time and it had everything we needed. very cute. We recently stayed at this property and it was a pure delight. Owners were very friendly and accomodating. The quaint, charming cottage is situated on a huge, lake front lot with a new dock. The lake is bigger than I expected and can accomodate any water sport. The lake water was astonishingly clear for a Florida lake. The neighborhood is very nice and closely situated to Mt. Dora, a good spot for shopping (antiques) and eating. We thoroughly enjoyed our visit and look forward to a return. MINIMUM ONE MONTH RENTAL. Also, during winter months, we prefer to have a tenant wtih at least a three-month visit during January through March, with some flexibility. Many upgrades since the photos were taken. Photos to be updated soon!